Friday February 11 was a historic day in Cairo, when Egypt’s President Hosni Mubarak resigned as president and handed over governance control to the military, after being 29 years in power. He had finally bowed down to an incessant demand for him to step down, from an 18-day pro-democracy demonstration wave by hundreds of thousands of Egyptians in Cairo, primarily in the Central Tahrir Square. Fireworks and joyous celebrations filled this city of 18 million, after Vice President Omar Suleiman made the announcement on national TV just after nightfall. Tens of thousands of Egyptians chanted outside Hosni Mubarak’s presidential palace in Cairo, that the people had ousted the president. In Cairo’s Central Tahrir Square, several hundred thousand protesters exploded into joy, cheering and waving Egyptian flags. Hosni Mubarak had tried to cling to power and to pacify the people, by handing over some of his governance authorities to Vice President Suleiman, while keeping his president title. However, following an explosion of people’s protests on Friday rejecting his appeasement move, it appeared that the Military had forced him to resign. Hundreds of thousands of Egyptians marched throughout the day in cities across Egypt, while soldiers stood by, surrounding Hosni Mubarak’s palace in Cairo and Alexandria and the State TV building. Friday was the biggest day of protests yet in this historic people’s upheaval, that began on Jan. 25. Growing from youth activists working on the Internet, it developed into a mass movement of widespread protest on Mubarak’s authoritarian lock on power, corruption, economic woes and widespread disparities between rich and poor. 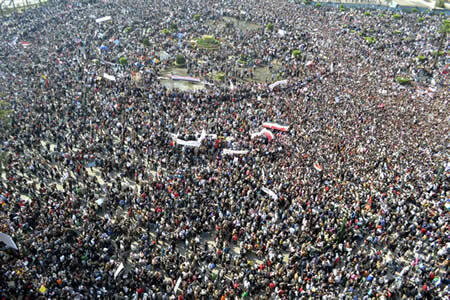 Finally, the people of Egypt were able to voice their discontent in public. Nobel Peace laureate Mohammed ElBaradei, whose young supporters were among the organizers of the protest movement, summed up the people’s feelings when he told the Associated Press that this was the greatest day of his life, that the country had been liberated after decades of repression, and that he expected a beautiful transition of power. The world will not soon forget the scene in Cairo’s Central Tahrir Square on Friday, the day that President Hosni Mubarak announced he was stepping down from his 30-year rule after 18 days of protests. Surrounded by celebrants, NBC’s Ron Allen shouted from the Square that this is what freedom looks like, that people cannot contain themselves as this is the moment that they have waited for. From Egypt, to Tunisia to Algeria to Libya, this liberation wave has spread along Northern Africa. On the other side of the seas, the relatively wealthier Gulf State of Bahrain has also joined Yemen and Jordan among the growing list of dissatisfied citizens demanding governmental changes. So now what should the political governance change consist of, so that community development and people’s socio-economic security are the prime considerations? Can we propose to Nobel Peace laureate Mohammed ElBaradei a governance system for the people by the people, a truly civilian democracy, which even the world has not hitherto known ! So, let us hence examine the concepts involved in this neo-governance system. • Conducive environment for physical, psychic and spiritual development. A society that is able to maintain such a progressive state can be labeled as being civilized. When this civilized societal state and development can be sustained in a community, we can term this state to be sustainable development. Thus, sustainable development implies sustainability in all the above mentioned quality-of-life and happiness factors of human living. The aims and measures of sustainable development as well as its components need to encompass all segments of society and reach down to the poorest segments. Hence, in Developing countries, it can be advocated that poverty reduction be undertaken as a priority, rather than just focusing on an increase in productivity and output or burgeoning of the middle class. Obviously in terms of social justice, one cannot accept sustainable development which continues to maintain the wide gap between the rich and the poor, between the G-7 countries and the developing countries. Let us hence walk down the lane of such a Sustainable community, and analyze the social, economic and political factors required for (i) poverty alleviation, (ii) adequate peoples purchasing power for produced goods, (iii) opportunity for everyone to fully develop and utilize their potentialities, and (iv) resulting improvement in the quality of life for all people. For a community to be sustainable, it should have (i) a universal social outlook, which will provide a binding force for its different ethnic and cultural groups, (ii) a cooperative (or peoples participatory) economic system, (iii) and a peoples empowerment providing civilian democratic political system. 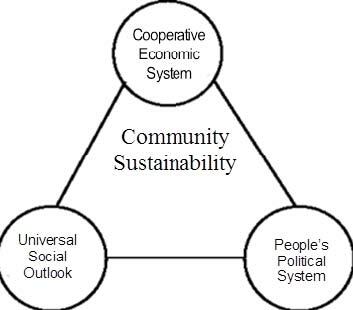 In other words, a community should have socio-cultural, economic and political sustainability, as depicted by the Community Sustainability triangle in Figure 1. The Sustainability triangle is our new concept, whereby we bring together the minimum set of three requisite factors for a balanced (stable) system, and apply it to social systems, governance systems, production systems, community-sectorial system, etc. It is based on the concept that the minimum number of components of a stable system is three, based on the concept of equilibrium of forces acting on a structure. Generally, people are influenced by and attached to narrow group sentimentality of culture, race and religion, to favor their own group. This causes polarization in society, to the extent that people having religious or ethnic background different from the main stream population get marginalized. How can we rise above this type of narrow sentimentality? Because of Consciousness being deemed to be the fundamental source and constituent of human mind, all human beings can be considered to be bound together by common ties of fraternity. Furthermore, the destinies of all human beings are inter-linked. The important idea, from a social view point, is that human society is one and indivisible. This concept of universal social outlook is based on the doctrine of Neo-humanism, propounded by the great sage Prabhat Ranjan Sarkar. Neohumanism inspires us to raise our consciousness above narrow sentimentality by recognition of the divine origin of all human beings. The key to global peace is, hence, for all people and all nations to accept and imbibe the universal social outlook, and develop public policies based on the concept of one for all and all for one. There are invariably many obstacles in the implementation of such a progressive neo-humanistic social outlook, caused by a great majority of the people in the world not having the basic necessities (food, shelter, clothing, health-care, education), as well as other requisite physical amenities to save time spent in physical chores. This points to the need of a Neo Socio-Economic Order, to foster a conducive environment for optimal development and distribution of human and earth resource to: (i) enable all human beings to afford the basic necessities of living, (ii) be materialistically comfortable by meriting emoluments commensurate to the significance of their work in society, and (iii) (at the same time) be able to develop their parapsychic (and spiritual) potentialities. So then, let us enunciate some of the tenets of our new Cooperative Economics Model, based on the socio-economic-political theory called Prout (Progressive Utilization Theory), propounded by preceptor Prabhat Ranjan Sarkar. The first tenet is the common patrimony (along with rational consumption, equitable distribution and maximum utilization) of the natural resources of the planet. The second tenet is that, for individual security and societal stability, the minimal necessities of living (housing, clothing, food, healthcare and education) need to be guaranteed through 100% employment and minimal wage. The third tenet is that the remuneration for ones contribution at work and to society needs to be proportional to the importance and value of the contributions. The fourth tenet is that the productivity of commodities be proportional to the collective need, and that prices be kept stable; this will help augment purchasing capacity and standard-of-living. The fifth tenet is that the Socio-Economic system should foster the development of physical, intellectual and parapsychic (or spiritual) human potentialities as well as their implementation for collective welfare. These economic tenets are summarized and are represented in the Socio-Economic System triangle in Figure 2. Why do we need an alternative political system? What is wrong with our present-day widely touted Democratic system? The present-day Democratic system is essentially Political Party governance, instead of Peoples Democratic governance; it is hence totally undemocratic. In other words, the elected governing parties impose their own policies, agenda and biases on the people. Political parties are like corporations, and the elected political party essentially controls the state assets during its ruling period. In Developing countries, this is the time for the ministers (who are members of the governing party) to make money (for their families and next generation) through corrupt practices. The next disadvantage is that the ministers and cabinet members are appointed from among the members of the governing party. So there is no appropriate match between their backgrounds and their portfolios. The biggest objection to this Political Party-based Democracy is the total waste of time and public money caused by (i) the governing party wanting to pass legislations according to their party policies, and (ii) the opposition parties finding faults with the legislations and preventing them from being passed, often at the expense of peoples benefit (as is the case with health reform in US). So then what are we advocating? In the community sustainability triangle (of figure 1), the three balanced components are (i) Universal social outlook (presented in section 4), (ii) Multi-faceted economy (discussed in section 5), and (iii) Peoples political system which is our new concept of Civilian Democracy, without political parties. The basis of CDPS is that the direct link of government with the grass-roots people is through the various sectors of the community, such as the education sector, healthcare sector, legal sector, agricultural sector, industrial sector, finance and banking sector, transportation sector, etc. Each sector can be represented by an association, such as the association of school teachers, association of doctors, association of lawyers, farmers association, association of industrialists, association of bankers, miners association, etc. Each sector is concerned with promoting its optimal function, such that the sector serves the people in the best possible way, and the interests of people working in the sector are also served. Hence, if each sectors association elects its most competent representative to the state legislative assembly or government, then this representative would be in the best position to enable the sector to best serve the people as well as look after the interests of the people working in the sector. This is the basis of the Civilian Democratic Political system (CDPS). Herein, the government is composed of elected representatives of all the sectors of the community or state. Thus the State health minister, elected by the state healthcare association, would be a healthcare professional; s/he would hence be in the best position to know how the healthcare delivery system and policy should be structured and budgeted, such that people get the best healthcare that the state can afford to provide. Likewise, the state education minister, elected by the association of educators, would be an educationist and would hence be best able to develop the state education system (so as to best serve the education needs of the state). Also, as a representative of the association of educators, s/he would also be able to look after the welfare of school and college teachers. The Civilian Democratic Political System (CDPS) would also be most fair and economical, because it would be eliminate corporate financial support of costly election campaigns of political candidates, who in turn are obliged to frame public policies favoring these business groups. It would also eliminate partisan politics and governance policies being shaped by the biases of political parties. Thus, the Civilian Democratic Political System (CDPS) can truly be termed as the Peoples Political System (PPS). It is to be noted that a stable financial system of a community is linked to its economic and political systems and policies. There is no reason why we should have ongoing alternating inflations and depressions. Our proposed CDPS (or PPS) would ensure a political-economic policy which is in the best interests of the people, and thereby also safeguard the economy and peoples assets. In the context of the current financial crisis plaguing the world today, two prime factors (aside from fraudulent banking practices at the expense of their clients) behind this crisis are (i) the big unethical disparities in wealth promoted by the capitalist system, thereby money having lost its capacity to be the unit of socio-economic equilibrium and stability, and (ii) investment of wealth in enterprises of non-yielding returns, such as in excessive defence spending and unjustified wars, which do not earn any income in return. Our people’s political system would prevent such a flawed political-economic policy and wastage of people’s assets, and hence contribute to a stable economy. This is verily the Civilian Democratic Political System (CDPS), as the People’s Political Governance System (PPS), that we are proposing for Egypt to Nobel Peace laureate Mohammed ElBaradei. In years to come, this could well be the starting point of a new ‘people wave’ sweeping across the world to replace the present-day Political Party Democracy by Civilian Democracy, which the people of the world have never before known but will come to love as it will give them socio-economic security and a fulfilling life. The beauty of this governance system is that it would suit and could be adopted by countries with all systems of Government: (i) Presidential Republics, (ii) Parliamentary Republics, (iii) Constitutional Monarchies with ceremonial monarchs, (iv) Constitutional Monarchies with active monarchs. Thus, all countries can come to adopt this Civilian Democratic Political System (CDPS), which will bring about political, social and economic stability due to people’s satisfaction. 1 Ghista, D.N., Socio-economic Democracy and the World Government: Collective Capitalism, Depovertisation, Human Rights, Template for Sustainable Peace; World Scientific Publishing Co, Singapore 596224, 2004. 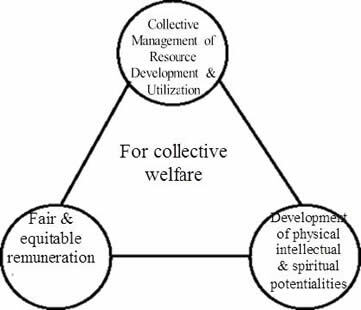 4 Ghista, D.N and Sanyal, S., Sustainable Development of Developing countries: A Holistic Socio-Economic-Political Approach; Journal of Environmental, Cultural, Economic and Social Sustainability, Vol 3 (1), 2007.